Three Safe-to-Eat Cookie Doughs: Chocolate Chip, Sugar, and Cake Batter! I’m siiiiick. If you follow Willow Bird Baking on Facebook or Twitter (you do, right? ), you’ve probably heard me whining about it lately (okay, maybe this isn’t the best way to encourage you to follow). It started with a sore throat and has turned into a beastly, phlegmatic ogre of a cold that has taken up residence in my chest and commenced hanging draperies and such. I have protested this development with various hot teas, soups, and my favorite home remedy suggested by readers: complaining. I know my students are to blame for this plague! They’ve been dropping like flies recently. A wave of 6th graders was sick early in the year, and then 7th grade took a nose dive. At one point almost half the class was home in bed, weeping at the thought of missing their fantastic language arts class and writing pickup essays in fond remembrance of healthier days. That’s what students do when they’re home sick, right? I can’t stay home until I’m better, but I do tend to baby myself when I’m sick. Take, for instance, the vat of spicy crab chowder and loaf of sourdough bread I allowed myself to eat yesterday under the guise of “feeding a cold” (not that I starve a fever or anything). And I’m not even going to mention the amount of this cookie dough I consumed over the weekend. I’m sure cookie dough has, like, vitamins and stuff. If nothing else, cookie dough is good for the soul. As a child, my idea of adulthood was finally getting to sit down with a tube of technically-unsafe-to-eat-before-baking cookie dough, slice it open, and eat the whole thing — no parental scolding involved. And now, look how far I’ve come: this weekend I made not one, but three kinds of cookie dough! Not only that, but they’re all eggless and therefore actually safe to eat*. Chocolate chip cookie dough recipes are popular and easy to find, but safe-to-eat sugar cookie dough is a bit more elusive. I developed the recipe below from a regular sugar cookie recipe. But the dough that really takes the cake (literally!) is the Cake Batter Cookie Dough. Jessica at How Sweet It Is has been going cake batter crazy lately, and I’m loving it! 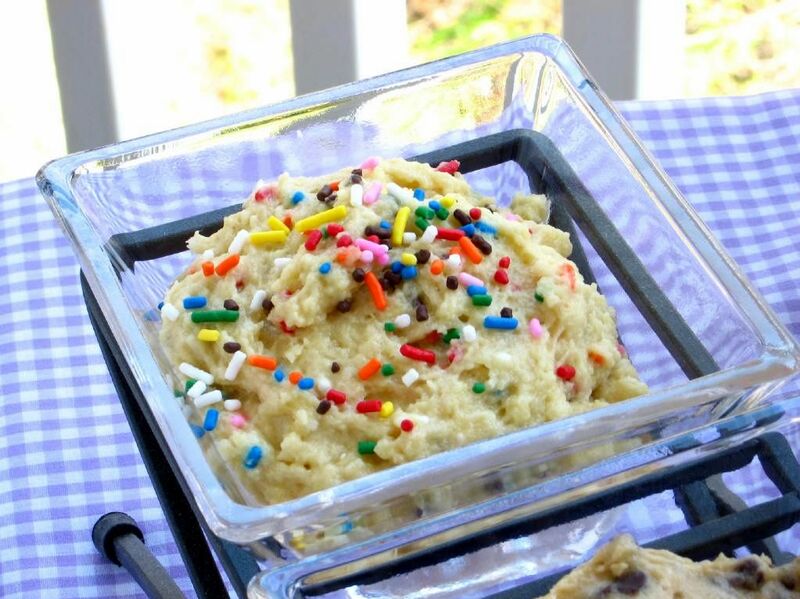 Inspired, I decided to create a rich cookie dough that tastes like buttery yellow cake batter, complete with sprinkles. There’s just something wonderful about food that tastes like a birthday party. Oh, and are you wondering about those truffles in the photos? Stay tuned — I’ll tell you all about those soon, along with yet another awesome use for cookie dough! So, in summary: I’m sick. My students are sick. We’re all sick. Eat cookie dough. Chocolate chip cookie dough you can eat on a spoon! *Note: Since posting this recipe, scientisty types have also found that raw flour — just like produce — can carry E.coli if it’s been contaminated with it. This article suggests that the risk is even smaller than the tiny risk of getting Salmonella from eating cookie dough with raw eggs, but it’s still there and I wanted you to know about it. At least eggless cookie dough is safer — and no reason to waste the eggs when you just want to eat it with a spoon, right?! 389 Comments on Three Safe-to-Eat Cookie Doughs: Chocolate Chip, Sugar, and Cake Batter! I just made that one because I was in Thebes mood and I swear we never usually keep anything of the usual sort in or pantry, but we had all of this stuff and I am in love with it. This is so good, I love it so much. Being a teenager, and especially being a girl this was an amazing fix! Thank you so much!!!!! I was just reading that if you microwave the flour 3-5 minutes, stirring frequently, it’s safe for the cookie dough! Hooray! I thought flour + heat = exploding flour? Maybe not for just that long? Hope it works out! haha, I loved it! 🙂 Thanks, Jordan! Mayyyyybe so! 😀 Thanks, Mara! I’m on her wavelength, Muppy, except I like the dough, batter, cookie, cake, cupcake, scone, pastry . . . oh well, you get the idea. Yes because of the butter. Sounds perfect to me!! I can’t wait to see what more you have done with these! I can’t wait to post it!! Thanks, Maranda! Ooo girl I hope you feel better! I have a feeling that cookie dough has antimicrobial properties. Somewhere in there. It must. My mother still yells at me for eating cookie dough. And cake batter. And cupcake batter. basically she calls me and starts the conversation by yelling at me to stop eating raw eggs because most of the time when she calls, I am knee deep in a batter of some kind. I love these! Now I can eat cookie dough self righteously and totally virtuously and salmonella-free! The cake batter is the one I’m going to have the hardest time resisting! This sounds like the perfect thing to alleviate tax preparation anxiety as well! funny coincidence, just before reading this post, my 3yr old son and I made ANZAC slice (an Aussie thing with golden syrup, melted butter, oats, coconut, brown sugar and plain flour) which is our favourite “raw” dough to make…its supposed to make biscuits but my laziness get the better of me and I make it into a slice! Delicious raw or cooked! P.S. Hope you’re feeling better soon….. Eating cookie dough sounds like a reasonable way to heal ;)…feel better! Oh wow, this is kinda evil. 🙂 Now I know what I will be making next time I get one of my late night sugar cravings. Hope you feel better soon! This is definitely late-night craving materials — quick and sweet! Thanks, Emily. These look awesome! Hope you feel better! I made an eggless choc chip and fried it like they do at the State Fair of Texas. Delicious! I know — I’ve been eyeing it! YUM! The perfect use for cookie dough (besides eating with a spoon) 🙂 Thanks, Taylor! This is GENIUS!!! I love cookie dough even more than cookies… I think I might go have some for brunch 🙂 Thanks for posting! I agree! Sometimes you just need some sweetness 🙂 Thanks, Lucy! Ummm…heck yes! All three of these look delicious and I can’t wait to try them! And Julie, I feel your pain regarding being sick. I just posted a recipe for a very healing beverage on my blog, in case you need a pick-me-up. 🙂 Here’s hoping we both feel better soon! I love this.. I could eat cookie dough by the bowl full and now I can do it without feeling guilty 🙂 Oh and cookie dough totally has vitamins in it. I don’t personally like (or understand liking) raw cookie dough, but Aunt Big’s gingersnaps are egg free and the dough is tasty (though it still has the yucky texture of raw dough). I make it with expeller pressed coconut oil, too. Mmm! That does sound delicious — I love coconut oil so much. First, I hope you are feeling better real soon. Second,oh my! Cookie dough is an all time favorite of mine. Love that you can eat these without the worry of raw eggs. I’m making this. Tonight, probably. I hope you’re feeling better! Thank you, Meghan! I hope you love them! My 7th grade student did just this, and he said it was delicious. He froze the cookie dough in a block and then cut it into small cubes to mix into homemade ice cream. I’d love to do it sometime, too! Hope you like it, Charlotte! Middle School students are seriously like little petri dishes. I must wash or purell my hands 10-12 times a day, easy. (I teach ms ELA – sounds like you do too?). 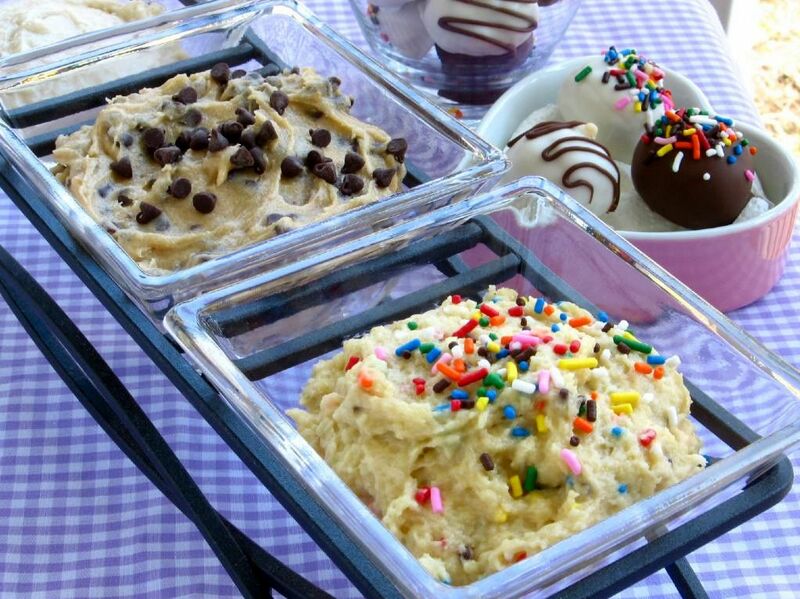 I’m trying your cookie dough truffles for my Easter baskets – can’t wait! 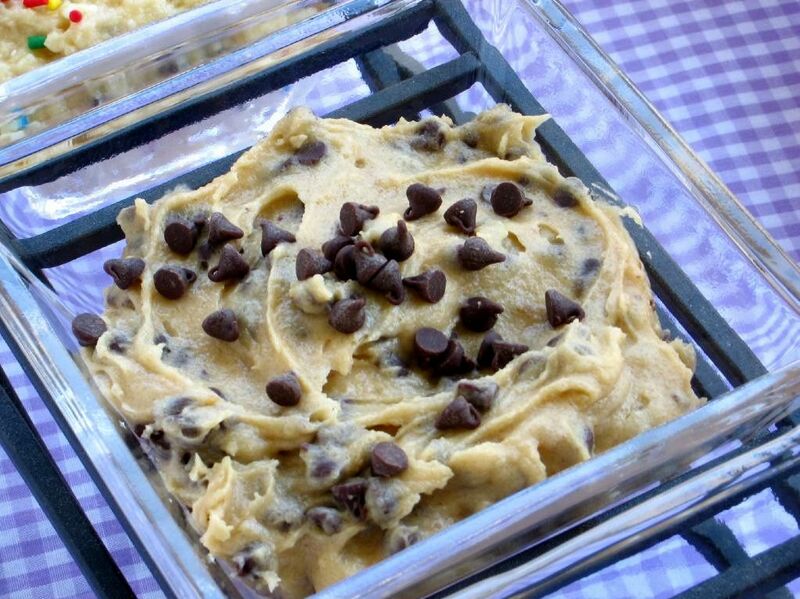 What a genius idea – egg free cookie dough. Love it. Is it possible to bake this? It wouldn’t work out, LillyFruit — this is just for eating the cookie dough. There’s no binder in it to make it bake up properly. For cookies, though, google “vegan cookies” or “eggless cookies” — there are lots of great options! Hi Katie! Thank you! These cookie doughs are kind of thick, so anything stiff would be good. I think some thick pretzel rods would be yummy! Or chocolate covered pretzel rods! Yum! I. Think. I. Love you. Mmmmm nom nom nom I must go buy chocolate chips now … and sprinkles … and cake batter! I am my mom’s first-born and she was young when she had me so I think I got a bit more spoiled than some kids. She used to let me have the ends of the cookiedough roll. Only the ends though. I found you through Pinterest. I made the chocolate chip cookie dough and the cake batter cookie dough yesterday as trial runs for a party I’m having. They both turned out great! Thank you! Yay! I’m so glad you enjoyed them, Rachelle, and hope all your party guests do as well! Thanks for visiting! What do you serve with these? Just scoop them on a plate with spoons or do you have any suggestions like graham crackers or whatever else? Thanks! I can’t wait to make these for my birthday party! Hi Courtney! I ate them with a spoon (ha), but you can also make cookie dough truffles (http://willowbirdbaking.wordpress.com/2011/03/23/cake-batter-cookie-dough-truffles/) or even better, deep fried cookie dough (http://willowbirdbaking.wordpress.com/2011/03/27/deep-fried-cake-batter-cookie-dough-2/) — both rock! now if you can do brownie batter and blueberry muffine batter !!! YES, safe-to-eat brownie batter PLEASE! Yes, it will keep for at least a week in an airtight container in the fridge. Oh. My. Goodness. I think I just fell in love. CANNOT WAIT TO TRY THESE! Thank you thank you thank you thank you thank youuuu!! You are soooo welcome 😉 Hope you love them!! I don’t know if anyone’s mentioned this, but PASTEURIZED EGGS EXIST! I was so excited to learn about that, since it means any cookie dough/cake batter recipe can be consumed safely! This is true; there’s also a low risk of salmonella even with other eggs purchased in the U.S. (especially with careful handling and if you wash the shells). However, if you’re making it just to eat (or to use in a recipe), why waste the eggs? I LOVE Cookie Dough, these are p.e.r.f.e.c.t.! Thanks. If you don’t mind me asking, where did you get the serving dishes, they make the dough look so pretty! Thanks. Thanks Kathy! My roommate bought those as a gift for me; I think she got them at Target! Yum! Thank you for these. Could they be baked into cookies, too? (ya know, as if I won’t eat all the batter as-is) At what time and temp? Brahhhh I use to eat the tubes of cookie dough!! I make sugar cookies, and I love cookie dough! So I will have to try this C C one!! Love your blog! Me too, Adrienne 🙂 Fond memories! Thanks! As soon as I saw this I had to try the sugar cookie, and my boyfriend wasn’t even a little opposed. I’m sure he’ll love being able to eat raw cookie dough without me yelling at him 🙂 It’s so good! I don’t even miss the egg. Can’t wait to try the Birthday Cake! Hooray! I’m so glad you liked it, Amanda (and the boyfriend too ;)) The cake batter is totally my fave — hope you get to whip it up soon! I just discovered your blog and I CANNOT wait to try this cookie dough! Thanks, Emma! I hope you love it! It’s so easy and quick, and SO yummy!! My little brother asked if I could make ‘cookie cupcakes’ and after a bit of pondering, I think it may be possible. I had this recipe bookmarked since the kid looooves raw cookie dough so I’m thinking vanilla cupcakes filled with the chocolate chip dough and iced with vanilla buttercream with some chocolate chips on top. 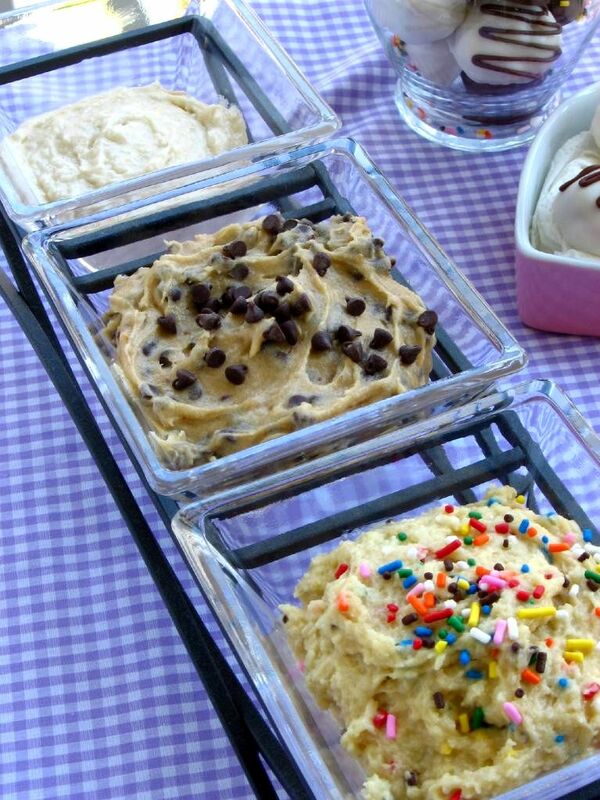 I can’t decide if it’s a gross or a genius idea (not a fan of raw dough!) but either way thanks for sparking the idea with this post! You totally can! I’ve done it before — some blogs even make a nice brown sugar “cookie dough” icing. Yum! I hope he loves the finished product — and MAJOR big sister points to you for being willing to make your little bro cupcakes 😉 So sweet!! They were actually amazing, so thank you so much for the cookie dough recipe, I may or may not have been picking at the leftover filling all day! I’d never made filled cupcakes before but having read all of your posts I’ve been inspired lately to be a tad more willing to try new things. I’ll stop raving before I sound like a deranged fan, haha. Hooray!! You’re now your brother’s hero 😉 And thanks so much for this sweet comment — LOVE that you were inspired to experiment!! Congratulations on a great job! I have to say, the chocolate chip cookie dough is absolutely delicious! I made the cake batter kind last night & the chocolate chip this morning! Thank you, Jordyn! I’m so glad you enjoyed it! I just can’t get enough of that cake batter dough! 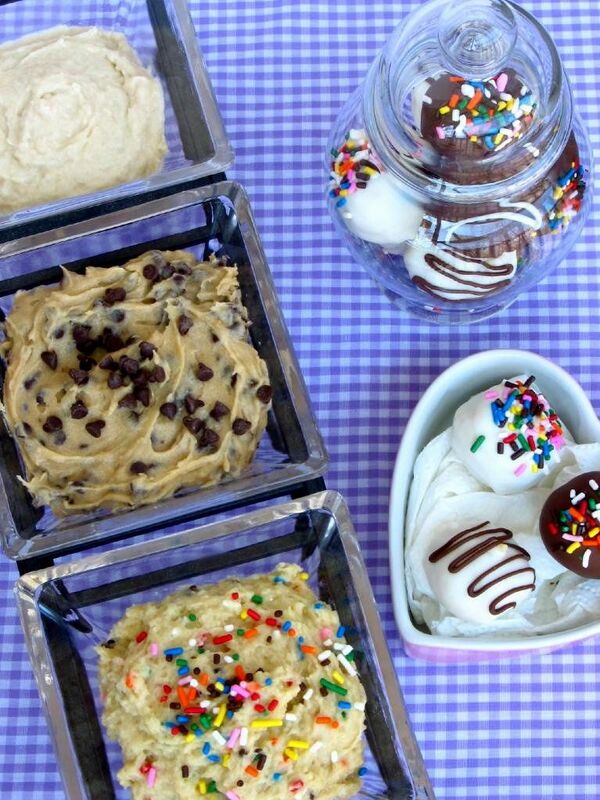 I can’t wait to make this for my daughter…she picks the cookie dough out of the ice cream. Do you know how long this would last? If I made a big batch? Hi Sarah! I think it’ll last quite awhile! I’d feel comfortable leaving it in the fridge for a week. After that, just to be safe, I might freeze it — it’ll last months in there, and you can just leave it in the fridge to defrost when you want some. Hope your daughter loves it! Ew. I’m sorry to say but this was a waste of time and ingredients. Tastes awful ):. Hi Sam — can you tell me which you tried and what the issue was? I’d love to help you troubleshoot this. When made correctly, there’s not really a distinction between the flavor of these doughs and your average cookie dough, so if you like that, you should love this! Give me some more details if you get a chance. I made the sugar cookie dough and followed the instructions but it tasted both too sweet and too flour-y at the same time. But upon adding more water, it just got thinner without losing the flour taste. Thanks for letting me know. The sugar cookie dough was developed exactly from a sugar cookie recipe (removing the leaveners and replacing the egg, neither of which add much flavor to the dough itself — the egg does add some richness). Sounds like your taste preferences might be better suited to a different sugar cookie recipe, however. You might try adding more butter, since it sounds like that’s the taste you’re missing out on (sugar cookie dough tastes buttery, sweet, and yes, floury!) You might also begin working from a sugar cookie dough you’ve used and enjoyed in the past to create your proportions. I tried adding more butter but it didn’t seem to help much. I eat cookie dough all the time, which is why I was interested in a safe-to-eat version. Sugar cookie dough is one of my favorites but I just didn’t seem to get a familiar flavor. I’ll try again. Thanks for your response. I like the little trays you have in the picture. Where did you get them? Hi Megan! Those were actually a gift from my roomie, but I believe she got them at Target. I came across this page on Stumbleupon and it absolutely made my day! Just before that, I was looking for a recipe for something sweet that I could make with the few ingredients I had around. (I am a college student and therefore does not have the money to go and buy new ingredients*sad face*) I had given up when I found you! I made the sugar cookie dough and I am so excited to eat it! I am thinking about adding some cinnamon cause well I love cinnamon! Thanks again! Hooray! Hope you love it, Ashley! Let me know! I’m a big fan of the sugar cookie dough. Cinnamon is a great idea — in fact, I’ve been toying with the idea of creating a snickerdoodle eggless dough. Sounds so yummy, right?! I can’t believe we had the same childhood dream…mine was to eat a whole batch of cookie dough without my mom stopping me. It makes me feel sick, but doesn’t stop me from trying. Your recipes are up next, especially the cake batter dough! I guess getting a tummy ache from FINALLY EATING WHAT YOU WANTED ALL ALONG is some sort of rite of passage 😉 Love your post — too funny! Just made this tonight for my husband and myself. We are students facing finals week and needed some study food. Thank you! I discovered you via pinterest, and decided this would be tastey enough to combat the stress of studying. 🙂 The cake batter dough is delicious! I made it with funfetti cake mix, and it was delicious. Now I can totally market this as an exam aid, right?! I bet taking some in to your professors wouldn’t hurt either 😉 Thanks, Becca! So glad I could help. I’m so happy I found your website! I’m twelve weeks pregnant and have constant dreams about eating cookie dough. I found that I can’t have it in the house because I will try and eat it without cooking it first, and now that I found this I can finally eat the cookie dough that I crave. Thank you! Yay!! So happy I could help, Liz 😀 I hope you enjoy every bite. One of the few upsides of my son’s food allergies is that ALL cookie doughs and cake batters are safe to lick from the bowl, because they have no eggs in them. Chocolate cookie dough that’s safe to snarf is a silver lining I can live with! So true, Libby! Way to find the upside!! This might be a stupid question, but can you actually bake this dough into cookies – how much dough can you eat? Hi Sandra! Not a stupid question, but no, this dough will not work for making actual cookies because it has no binder (that’s the job eggs do — or flax seed in eggless cookies). You can eat as much dough as your heart desires and your stomach allows. If you’d like to make more or less dough because you have varying numbers of folks eating the dough with you, feel free to scale the recipe up or down as needed. Hi I noticed that the CC cookie recipe doesn’t call for granulated sugar. I tried it without but it was all wrong. I added it and it was much better. Maybe that is what the previous person was missing. I agree though she could have been nicer abt it!! I am excited to try these recipies! My daughter loves cookie dough. She thinks you should make a recipe for brownie batter too. That would be yummy!! That sounds delicious! I’ll have to get to work 😉 I hope you both love the cookie dough! Love it 😀 Thanks, Heidi!! Just found your blog, Yum! I knew I wanted cookie dough right away but I only had ingredients for the sugar cookie dough on hand. It really didn’t come out that great. It was really floury tasting, so I added some cocoa and a little salt to combat that flour taste an it still is not my favorite. 🙁 However, I think I’m gonna get the stuff and make the cake batter one as that one seems to have gotten a great response. Hi Alex! I’m sorry you didn’t love it. This recipe was made from a regular sugar cookie dough recipe and lots of folks adore it, but some people have different tastes about the flavors they like to be the most pronounced in their cookies (and doughs!). For instance, the floury “unbaked” flavor in cake batter and cookie dough is what I love so much! To find a sugar cookie dough you love, try getting a sugar cookie recipe you know you love and removing the eggs and leaveners, adding water to substitute. You go for it, girl! 😉 Thanks! As someone who is allergic to raw cookie dough I want to thank you for these recipes. I love raw cookie dough but every time I eat it I have to suffer through itchy hives and the like. Your safe-to-eat cookie batter is so yummy and delicious and I can eat as much as I want without any side-effects! Thank you!! I have been eating cookie dough, brownie batter, and cake batter for over 40 years and I haven’t died yet. It seems that everyone says that you aren’t suppose to eat it, but everyone does. Eating it is so good, there is nothing like it, especially chocolate chip cookie dough. We have made chocolate chip cookie dough just to snack on. Just curious, what is the point of the water? When I made this it turned out very creamy and I was afraid to add too much water. I only added 2 tablespoons. It was good though, maybe a little too much salt for my taste. Thanks for the recipe!! Emily, the water is to bring it to cookie dough-like consistency. You add it 1 tablespoon at a time, though, so as to get it where you want it. Sometimes I go without the water; other times I add a few tablespoons to make it creamier. It’s all personal preference 🙂 I’m glad you enjoyed it! Or the in-between time 😉 Thanks, Meagan! Hey! This looks like a great idea! The only problem is i dont know how much i should make. i want to make this for a new years eve party that will have over 10 people. Any ideas? Hey Danielle! I have a rough idea. I made this recipe for 6 middle school girls and a single recipe was enough. I might double it for 10 people, assuming they’ll be eating other things as well and won’t be able to stomach TOO much straight cookie dough. LOL. The great thing about it, though, is that it freezes well if you have leftovers! The chocolate cookie dough SUCKED. I’m not too sure what you all are eating, but it must not be what i made. Never again. The chocolate chip cookie dough is a regular cookie dough recipe minus the eggs, which impart negligible flavor. Therefore if you enjoy regular CC cookie dough, you should’ve enjoyed this recipe — unless it was made wrong, of course (some of my students have done this, and upon fixing their mistakes, have enjoyed it — I’d be happy to help you troubleshoot the process). I’m sorry you didn’t enjoy it, but perhaps you can think of a nicer way to express yourself in the future. Tsk tsk. Aw, thank you, Randall! I am SO excited to hear about your delicious ice cream — I’ve always hoped someone would try that and report back! It sounds amazing! I think I might love you. I made this today and can’t stop eating it. I LOVE cookie dough but never eat it cause of the raw egg. Now I can. You are awesome. Thank you. I have no idea what people are complaining about; this tastes spot on!!! I made the chocolate chip cookie dough (although I was hesitant after reading some people’s posts) and I’m glad I did. It tastes exactly like cookie dough that needs to be baked. I added water until I got it smooth enough and skipped the salt. It turned out AWESOME! THANK YOU!!! Also, I’m sick. Can I justify eating the whole thing? And, in the very small chance that I don’t, how do I store this? Fridge?? Good to know you skipped the salt and enjoyed it — a couple people said it was too much for them. Folks might want to start with just a little and add it to taste if they worry. AND YES, you can eat the whole thing! I can’t promise medicinal benefits, but I bet there’ll at least be a nice placebo effect 😉 And you can store it in the fridge or, if it’ll be over a week or so, stick it in the freezer. Thaw overnight when you want to eat it. Thanks for commenting! So glad you enjoyed it. Super good recipes! i mad the chocolate chip one today! one thing i would recommend, the flour taste was pretty evident, so i would either put a little less in, or add just a little more brown sugar and vanilla…but still super yummy! I’m glad you enjoyed it, Steven! I’m not sure what you mean about the flour — since it’s cookie dough, it should definitely have a flour taste, but I’ve never found it the primary flavor or overwhelming in the choc chip dough. Nevertheless, the recipe’s simple to adapt to individual tastes as you said! Looks wonderful! My problem is that I’d, probably, eat the whole thing! I made a variation of eggless cookie dough and chocolate chip cookie dough dip added some crwam cheese and dipped it on graham crackers. Angie, that sounds delicious! Thanks for sharing that idea! There might be a third one in there; you just never know! Maybe a triple batch just in case… 😉 I’m so glad you’re enjoying it, Kaydee! Cheers to you and baby(/ies)! Typical of me I’m more excited about a tiny thing you mentioned than the actual point of the post but… do you have a recipe for spicy crab chowder? Yum!! I love raw dough, but didn’t know about the possibility of E-Coli in flour. I found this ‘recipe’/technique for toasting flour. I think I will toast my flour first and then make these wonderful, edible doughs. Good find, DD! Sounds like it would add a nice flavor, too! Loved the idea of this, but the texture of these was just off. Maybe the egg is what makes the magic. Have tried other cookie dough dips with cream cheese instead of the flour with better outcome. Tina, can you describe the texture to me? I didn’t have the same experience — mine was right on. Are you sure your butter was room temp when you creamed it with the sugar (usually takes 2-3 minutes for the granular sugar to dissolve)? I made the chocolate chip dip with almond flour instead of regular flour and it was DIVINE. So good!!! How much water for the first recipe? Alexandra, the amount is not listed because you add it a tablespoon at a time and stop when it reaches the consistency you prefer. I usually end up adding just 1 or maybe 2 tablespoons. Thank you so much for your website–I love it and all your recipes. My deepest apologies for not considering Pinterest etiquette & posting the recipe on the description!!! Thank you for being so nice about it and explaining the copyright and how this is a business for you. I am a big internet dummy who didn’t realize that! No, Jen, please don’t feel bad at all!! That’s totally fine — I know most people don’t even realize it. I’m just thankful you wanted to pin the cookie doughs 🙂 Thank you so much! These look amazing but what do you put these dips on, more cookies? Fruit? I’m hoping to mak it tomorrow! Thanks! They’re actually not dips — they’re cookie doughs that are made to eat from a spoon. I’ve seen them pinned on pinterest as dips, but they might actually be too thick for that. You could thin them to the consistency you want by adding a bit more water, though, and use graham crackers, pretzels, animal crackers, etc. to dip in them. Hope you enjoy it! My sons are allergic to eggs so I love that I can give them cookie dough (very occasionally) now. Thank you so much for the YUMMY recipes! You’re so welcome! I’m glad this will be a good alternative for them! Now just convince all my teen and tween students that, Heidi 😉 Hope you love it! I’m so glad you enjoyed it, Tory!! Thank you! I’m really anxious to make these, but I’m just wondering whether they can be made into cookies or if they are only meant to be dough? My dad loves cookies but not the dough, but my brother and I love the dough. Thanks! Hi Cassie! They’re only meant as dough — they have no binder (the eggs) so I don’t think they’d hold together if you tried to bake them. Yes, Jean, I added a warning below the recipe for folks concerned about flour, although I did read that the risk was lower than the salmonella risk. Folks should eat raw foods at their own risk. Thanks for sharing. LOL, Megan! I’m so sorry you’re sick but also tickled that we had the exact same reaction to BEING sick! Enjoy your cookie dough, girl 🙂 Feel better soon! YOU ROCK!I LOOOVVVEEE COOKIE DOUGH!!! Ooooh, this sounds wonderful! I love the truffle idea! I always freeze my flour before I use it. I wonder if that helps with the safety at all? I just made the chocolate chip cookie dough. I’m pregnant and craving it. I used 2 teaspoons of vanilla and 2 dashes of salt, and everything else by the recipe. It’s really sweet to me, but I normally don’t like super sweet things anyway. Should I not have changed it? What can I do to make it less sweet? Less sugar? Thanks for your recipe and your help! Hi Sally! I don’t think decreasing the vanilla would make it more sweet, but decreasing the salt might’ve made it seem sweeter. Yes, feel free to try reducing the sugar to suit your tastes! It’ll be sweet no matter what, since it’s cookie dough, of course, but it might help! I figured out that it’s the chocolate chips. I never knew there could be too many. I’ll blame that on me being pregnant! LOVE THE RECIPE! LOL! Love it! Well now you know, girl. My students always say there can never be too many but I agree with you 😉 Thanks, Sally! So glad it can help satisfy your craving. So, I just made this for the fourth time, and I forgot the salt! Is it too late to add it when everything else is already mixed in? I’ve seen so many raw cookie dough recipes around lately & they all look so tasty. My concern is the raw flour which many yrs ago was believed to cause the salmonella outbreak. Is there any way to cook the flour before using it? Most professional online sites recommend against using raw flour, so are there any suggestions since these look too yummy to pass up? Hi Tiffany! The outbreak with raw flour was actually e.coli — still dangerous! If you scroll up through the comments you’ll see some discussion about it, and there’s also a link in the post itself to an article about raw flour to help you assess the risk and make the best choice for you. The fact is that there IS some risk associated with it, but not as much as with raw eggs. I knew Salmonella didn’t sound quite right. Thanks so much! I’m wondering it ground oats would give the same flavor (it may taste a littler nuttier) but would it be safer? I just read ConAgra Mills produces safe to eat flour since 2011. Now, I just need to find it & make some of those delicious “raw” cookie dough recipe!! I found this recipe on pinterest and saved it because I knew there would be a need for it. Let me tell you, after a long day of work, this was the perfect snack. It was super easy to make and definitely cheered me up. I never get to eat raw cookie dough because I tend to get sick really easily. This tasted just as good. I made a couple adjustments to your chocolate chip recipe, and then added some reeces pieces too. I wrote about it on my blog! Thanks for posting. I’ll definitely keep making this! Can I bake the dough into cookies as well? You’re so welcome, Anna! I hope you love it! So would these actually turn into cookies if I cooked them in the oven? They wouldn’t — there’s no egg to bind them together like regular cookies. The sugar cookie dough with just alittle bit of chocolate chips is great cooked to. I am not a big fan of cookie dough but love cooked cookies thank you. Sitting here, reading your post, and thought …. hmmm…. I should share my cream cheese cake cookie recipe with you. You could EASILY make this eggless. However, it makes quite a bit and I’m not quite sure if you’d want to cut it. The leftover dough refrigerates beautifully! This is a very comforting as a dough and I have a hard time NOT eating it raw! Cream butter and cream cheese. Add vanilla and egg (again, replace with 2-3 tablespoons water if making eggless). Add cake mix a little at a time, making sure to mix completely until its all blended in. Can add in candy, nuts, flavored chips if desired. Use no more than 1 cup. Just thought I’d share. (: Enjoy! That sounds delicious, Kristi! Thanks for sharing! That sounds so yummy, Alyssa! Next time you can also just add more water until it’s the consistency you want. I’m so glad you enjoyed it! what if you added an egg and then baked it? would it work well? OH My Goodness!!!! This dough is amazing! I eyeballed the ingredients and the first time it was ALL butter… so I went back and re-added all other ingredients. Instead of water, I added milk- it came out SOOOO creamy and good! Amazing recipe I will use whenever I have a craving of this sweet gooey delight! How much water in all do we need in the chocolate chip cookie recipe? Hey Kayla, You use just enough to get it to the cookie dough consistency you want. I usually start adding a tablespoon at a time, mixing in between, until it gets where I want it. I only made these because I was out of eggs (I’ve been eating cookie dough with eggs regularly since I was a kid and turned out fine, but it’s very good. This would be great for a classroom where you’re unsure of kid’s diet restrictions, though. When I become a teacher, I may bring this in as a reward for surviving AP exams. Oh how I LOVE edible cookie dough!!! I made up my own recipe awhile back and then I started seeing pins pop up all over Pinterest for different recipes! I saved a bunch a pins and am just now getting around to seeing all the different recipes! Yours look delicious! Yum, thanks for sharing, Helen! just tried the sugar cookie recipe:) its amazing! although i added a bit of milk to it to make it a bit more cookie dough consistency….but i cant stop eating it!! hi I saw this on pinterest and was wondering if the chocolate chip and sugar cookie batters would bake well? my little boy (18 months) is allergic to eggs and I am clueless about eggless baking. I saw this and thought it might be worth shot to ask! Hi Amber! Unfortunately these batters are made just for eating raw. They have no binder to replace the egg, and so they would not bake well. Hope you find a great recipe, though! I’d say a week in an airtight container, no problem 🙂 It’d also freeze very well! I added an egg and baked these still awesome! Raw flour has its e. coli dangers as well. So no, this is NOT a safe-to-eat recipe. Joyce, if you’ll read the post and the comments, this has already been carefully noted. Thank you. I did substitute milk for water when I made it tonight, but as it’s been a while since I’ve made it with water, I don’t know if there’s any noticeable difference. I don’t think they’ll work baked because eggs are the binder in regular cookie dough and these have no eggs (making them safe-to-eat in terms of not having salmonella). The raw flour is still a slight risk. i love your childhood dream of eating a whole tube of cookie dough as an adult! i had the same thought as a kid except with a whole bowl of brownie batter. i was convinced i would eat it ALL THE TIME. This is a great vegan dough. Just sub a vegan butter. Absolutely LOVED the recipe for the chocolate chip dough! Helped cure me of my cold! 🙂 I am pretty sure you are better, hopefully by now! Hahaha! Thanks for the delicious recipes! I don’t know a reason why it would — unless you have a gluten sensitivity or your flour is contaminated. OR you eat too much, I guess. 😉 Hope you enjoy! I’m so glad you enjoyed it, Tiffiny!! Hi there I just found this blog via Pinterest and oh boy am I glad I did! I have been enjoying cookie dough for years and have tried several different variations of the egg less kind and this is by far the best! I did add butterscotch chips to the sugar cookie recipe though. My family’s prefers peanutbutter to almost anything. Hi Linda, this has been discussed — please see previous comments and note on the post. Just tried the choc-chip cookie dough recipe, but modified it, substituting dark chocolate chips for white chocolate chips, and almond extract for the vanilla. Tastes amazing! Oh, but 1 tsp. of almond is CERTAINLY enough, just an FYI! For those complaining that this is not a “safe” recipe keep in mind that the author does mention in a final note that there is still some risk involved. No matter what we do in life there is always risk! Even with allegedly “properly prepared” foods illness occurs. The risk of getting e. coli from flour consumed raw is actually far lower than the risk of dying in an automobile related accident, or falling down in your shower. It seems most (not all) of the comments left here in regard to there still being danger are more likely those types who can’t stand that others are taking a risk. It’s a simple solution: If you feel this is unsafe you need not prepare and consume it. Let the rest of us make our own educated choice, thank you. As for the recipes themselves, bravo! I just made the sugar cookie dough and it’s good, but wayyy too sweet for my liking. I added some peanut butter sauce (melted peanut butter) and it made it a lot better. Thanks for sharing the recipes. I just made this and it’s very good. I found it a bit too sweet, so I’d like to finish it later. Is it alright if I keep it preserved in the fridge with some tin foil in a bowl for a few hours? Or will it go bad? It will be fine! I like to use plastic wrap for food storage rather than tinfoil because there are some things tinfoil will react to, but usually it’s things with acid (tomatoes/citrus) and so I think you’d be fine with this recipe. Enjoy! Forgot to mention that I did the sugar dough recipe without adding anything else. Maybe this defeats the purpose, but can they be baked like regular cookies? Not that I would, but I might want to. I just subscribed and am looking forward to other posts and to reading old ones. Jane, if you’ll notice, this issue has been repeatedly addressed in the comments and noted in the post itself. Folks will need to make their own decision about whether they will enjoy this recipe, but have been fully informed. Thanks. Thank you so much! Now I don’t have to worry about getting yelled at for eating cookie dough. Lol but I still found myself snacking on the ingredients while making this. THANK you for this recipe! I teach kindergarten and we are learning about ‘how to’ books. We talked a lot, and wrote about, ‘how to make a pizza’ this week. To finish our week on a sweet note, my class will be making pizzas…cookie pizzas! I was going to just have them decorate sugar cookies but then stumbled upon your recipe and now they will actually get to ‘roll out the dough’ to make their pizzas (and then add ‘sauce’ (icing), ‘cheese’ (coconut) and ‘toppings’ (M&M’s)! I am going to blog about it and am going to hyperlink to your post so that others can get the recipe as well! THANKS AGAIN….I can’t wait to see their faces in the am! Hmmmm, I wouldn’t have thought eating cookie dough would be easy on the stomach when you are sick. I think it was more a psychological balm. This is eggless cookie dough made to be eaten raw. It will not bake properly; I do not recommend baking it. Thanks so much for posting these! I just made the sugar cookie dough and it’s dead on for what I was hoping to have! It tastes a little too vanilla-ish to me. Otherwise I like it. I found this recipe when I realized that I have no eggs and I really wanted to bake some cookies. Made the sugar cookie recipe, and it’s delicious. However, I overcooked them and they are quite hard, good for dunking,but otherwise over baked. What temp do you set the oven and how long do you bake these cookies? Adrianmarie, this is cookie dough made to eat raw, not to bake. Airtight container in the fridge. Should keep for a week or two no problem. I’m not sure what you mean about rising. This dough doesn’t have any leaveners and won’t rise. It comes out the texture of regular cookie dough. To make truffles, just roll into balls, refrigerate until they’re less sticky, and dip. If you dont mind please put it up on your page i am only 13 so dont have a webpge so please put it up for me you dont have to include my name just please put it up.it works great. This is the recipe i used. In a bowl, cream butter and brown sugar until smooth. Add milk and vanilla extract and stir. Next, add flour and chocolate chips. Mix until completely incorporated. Hope you find it works. Thank you. Looks delicious, Jacob! Thanks for sharing! Did you use unsalted butter for all or just for the cake batter one? made the sugar cookie one and it was nothing but a dry crumply mess!!! had to add 5x the water to make it even remotley dough like! The moisture of dough will always depend on your environment, which is why the recipe specifies to add water 1 tablespoon at a time until you reach dough-like consistency. These where so, so good. I didn’t have vanilla so i switch it to cinnamon. which was amazing. I’ve made the chocolate chip recipe as written numerous times but today I wanted the traditional cookie taste. This is too heavy on the brown sugar IMHO. But if you split the sugar equally between brown and white, it’s perfect! So I tried making your regular just sugar cookie dough…..it was sooooooooo good. I tried a recipe on a different site and it had way to much sugar, but this one was amazing! im gonna make these and watch the fault in our stars. LOVE cookie dips! Love all the different flavors. Pinning now! I love this idea! …And yes, I used to shoo my kids away from the raw dough, but can’t wait to try this with my grandkids. My daughter is totally going to love this recipe! My dreams have come true! Thanks for sharing! Just tried the sugar cookie one and I’m in love!!! <3 Dying to try the cake batter one. Hi, can you bake this delicious stuff??? Try pretzels, graham crackers, cookies (mwahaha, the ultimate meta-dip! ), vanilla wafers! I think the big pretzel rods would be ideal! I was wondering if I were to use chocolate cake mix in the cake batter cookie would it make any difference othe than it being chcoclate? Nope! I think that sounds like a delicious thing to try! Enjoy! Shoot I saw “safe to eat” and then realized well nope it’s made with raw flour which is arguably riskier than raw eggs. I’ll keep hunting! This will probably sound like a weird question, but does anyone know how long these keep for? I love cookie dough, but sometimes it’s just too rich to finish off, so I was just wondering how long they’re good for if you pop them in the fridge, or freezer as well I suppose. 50Pingbacks & Trackbacks on Three Safe-to-Eat Cookie Doughs: Chocolate Chip, Sugar, and Cake Batter!